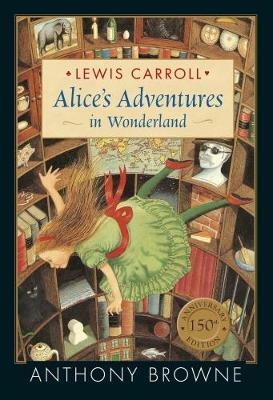 A dazzling anniversary edition of Lewis Carroll's classic story, illustrated by the award-winning Anthony Browne. Lewis Carroll's classic story is wonderfully re-imagined by award-winning and internationally bestselling illustrator Anthony Browne, in a special anniversary edition. The story of Alice and her adventures in Wonderland has enthralled generations of children since it was first published in 1865. Lewis Carroll's timeless masterpiece, now 150 years old, is richly visual in its telling and in this beautiful anniversary edition, Anthony Browne's dazzling illustrations are perfectly paired with the surreal quality of Carroll's writing, making this a book to treasure. My favorite story from childhood, the pictures are beautiful in their own right and compliment the story perfectly and un Disneyfy the whole thing.